Find out more information on us as a company and some of the partners that we work with. 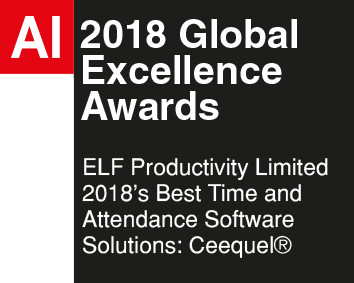 ELF Productivity Ltd, established in 1982 and providing workforce management solutions for over 35 years. 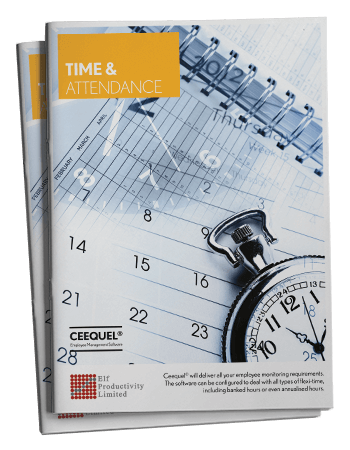 As the torch carrier for the Time and Attendance industry ELF Productivity Ltd are renowned for providing quality solutions that meet the customer's needs. In the 1980s ELF Productivity Ltd, provided work study engineers to evaluate business processes within the manufacturing and engineering sectors. Often deploying the early Ceequel® suite of products to streamline these processes and provide invaluable data when comparing actuals to standards. Due to the infinite configurability of Ceequel® Time Management, we soon gained traction in other sectors and began to earn the reputation of no matter what your rules, Ceequel® will deal with it! As IT infrastructures, servers, communications and PCs became more powerful so did Ceequel®. During the 1990's Ceequel® became one of the first Time and Attendance systems to be deployed across Wide Area Networks. Thus allowing for multi-company reporting and centralisation of key systems. As we push on to the future the Ceequel® portfolio continues to expand encompassing Access Control, Human Resource Management, Employee Self Service, Employee Tracking, Activity Based Costing, Machine monitoring, Performance Reporting, Shop Floor Data Capture and other browser-based options. This provided unparalleled functionality but most importantly this was delivered from a single database. The technological world is forever changing, at ELF Productivity Ltd we take this very seriously. As an ISO 9001 and ISO 27001 registered company we ensure we are ahead of the game. As the company grew so did the office space and in turn, so did the company. An Amano company, ATS are an innovative global provider of industrial time and attendance terminals for biometric and non-biometric workforce management requirements. The high quality, durable and user-friendly product line extends from entry-level time and attendance terminals to state-of-the-art programmable and best performing biometric workforce management and employee self service systems. Grosvenor Technology is a UK based company that have been developing leading workforce management solutions since 1989. During this time Grosvenor has built a reputation for outstanding reliability and providing first-class support and professional services. Established in 1862 and headquartered in Switzerland, Kaba is a leading global provider of Workforce Management and Access Control solutions to a wide range of industries and market sectors, offering high quality and reliable data capture terminals. With over 25 years presence in the global market, ZKTeco benefits from a highly qualified team of over 2500 employees worldwide with its own manufacturing plants that, together with its R&D and engineering departments, ensures complete in-house production of all aspects of its hardware, firmware and software. ZKTeco's products are currently present in over 200 countries, with over 180 million users worldwide. Digital ID has been supplying ID card software, plastic card printers for the plastic card industry and visitor identification systems for over 10 years and offer specialist knowledge and experience in all areas of plastic card and print solutions. They supply products to suit all budgets and requirements - from individuals looking for a custom printed lanyard, to a fully integrated ID card printer system. Based in Bolton since 2004, Comply at Work Ltd provides Health and Safety Consultancy and Training services. Services include Retained Support Service; Policy development; Risk Assessment including Fire, Computer Workstations, Noise and Hazardous substances; site audits and inspections, assistance with CHAS and Safe Contractor accreditation and the delivery of Health & Safety and First Aid training. Comply at Work won the Customer Excellence Category at the Bolton & Bury Business Awards, 2014. The PPMA Show is by far the UK’s largest Processing and Packaging Machinery Exhibition with over 300 exhibitors and more than 8,000 visitors. It showcases the very latest technology from machinery, industrial robot and automation technology to the latest machine vision solutions.